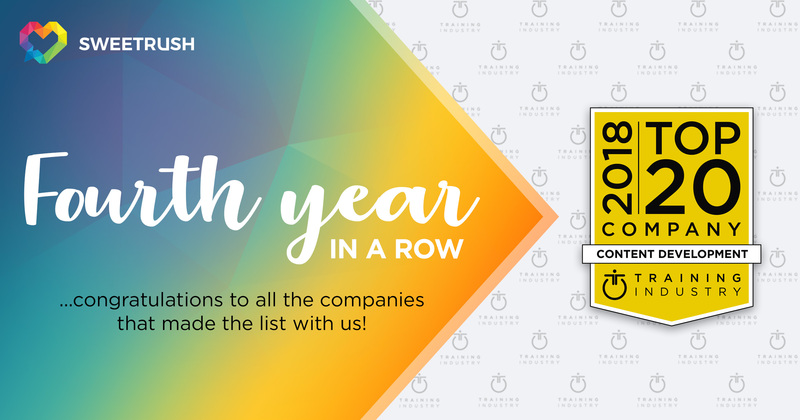 For the fourth year in a row, SweetRush has been included in the annual list of top 20 content development companies and recognized as an industry-leading training partner. San Francisco, Calif., May 17, 2018 — SweetRush has received top honors again, having been included in Training Industry’s prestigious list of Top 20 Content Development Companies for 2018. This is the fourth year in a row the company has received such recognition. Training Industry’s list, which was recently announced, acknowledges and celebrates the leaders in the development of learning content for training and performance improvement. Judges consider factors including industry visibility, innovation, capabilities, company size, depth and breadth of subject-matter expertise, quality of clients, and geographic reach. Training Industry, Inc., spotlights the latest news, articles, case studies, and best practices within the training industry, and publishes annual Top 20 and Watch List reports that cover many sectors of interest to the corporate training function. Its focus is on helping dedicated businesses and training professionals get the information, insight, and tools needed to more effectively manage the business of learning.